Everyone knows of the power of Haley’s Comet. It is one of the most spectacular wonders of our solar system, visiting us every eighty years. It blazes across our skies, with its spectacular tail aglow, and has sealed its place in the human history of the sky. It holds a special place in our hearts. Did you know we have a special connection with Haley’s Comet? 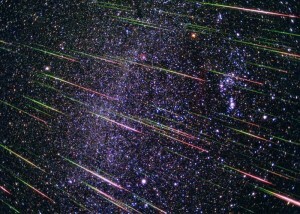 It comes in the form of the Eta Aquarids Meteor Shower. This special shower arrives in our atmosphere in April of every year. The meteors themselves are the particles of Haley’s Comet that were ejected from the Comet on its previous passes through our solar neighbourhood. They are a direct link with the very matter of Haley’s Comet. We are graced with the presence of the Eta Aquarids for approximately one month, between 20th April and 20th May. This is a period when they filter down to Earth, and enrich our skies with the natural star-stuff of which they’re made. This meteor shower is unique in how it spreads itself out. Rather than a brief period of intense activity, we have a longer period in which the meteor activity spikes during. Many people report these tiny starlets having an effect on their lives over this period. The slight wink and flash of a meteor from the Haley cloud can have the most profound effect on the lives of those underneath it. As ever, understanding exactly how the meteor storm influences our lives can be difficult, but it’s clear that since ancient times, these meteors and the comet that birthed them have figured large in human history. 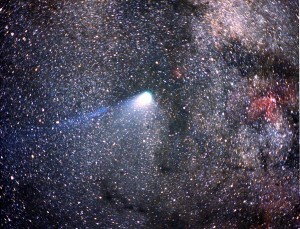 Even if we go back to the Middle Ages, we can find how this comet figures large in our history. During the preparations for the Battle of Hastings and the Norman conquest of England, the comet was depicted roaring through the night sky above in the documenting Bayeux Tapestry. It appears the comet itself is a harbinger of dramatic events. Similarly, the arrival of the meteor shower seems to mirror the return to life in the landscape of the northern hemisphere. As the meteors begin to flash across the sky, Spring is in full swing. These meteors always appear after the powerful Spring Equinox, and they herald a brand new part of the year for many. As such, these meteors are often associated with rebirth and regeneration. There are those who seek to utilize their energy, slowly catching the energy that they transfer. One thing is for sure, they help to make the night sky that little bit more beautiful. The other great aspect of the Eta Aquarids, is that unlike the comet itself, we see the arrival of these meteors every year. They are not removed from us like the comet is. They are a regular and priceless feature of our planet’s place in the solar system. We can count of the Aquarids. Do you enjoy watching for shooting stars? Have you ever made a wish on one? We'd love to hear your experiences, so please feel free to contact us via our Facebook Page. We love meteor storms, so let us know what you think about these cosmic visitors.